I had the fortunate pleasure of attending a dinner hosted by Chef David Santos at his humble abode on Roosevelt Island (I mean, how cool is that?! We're practically neighbors!). Alice invited me to tag along for the dinner featuring a "Tasting of Vegetables," and I was happy to oblige, with Linda as my honored dining companion for the night. Though, I should stipulate one tidbit about this said dinner --- shhh, it's kind of a secret! Inspired by his Portuguese heritage, Um Segredo Supper Club was created by Chef Santos to host a series of "secret" dining events (in fact, um segredo actually translates to mean "secret" in Portuguese) curated/created/prepared by Chef Santos in his very own kitchen. The first installment took place during late November 2011, when I had initially heard about it through Alice and from various sources of foodie news. Now, February 2012 being Um Segredo's second installment, Chef Santos has hosted another series of dinners with a distinct menu each weekend throughout the month. The lucky attendees can bring their own wine (with a particular emphasis on just bringing what you like to drink) and a $75 cash donation for the dinner -- exactly what what we did -- to the designated "secret" venue. With each dinner capped between 8 to 12 guests, it is quite the intimate dining experience. 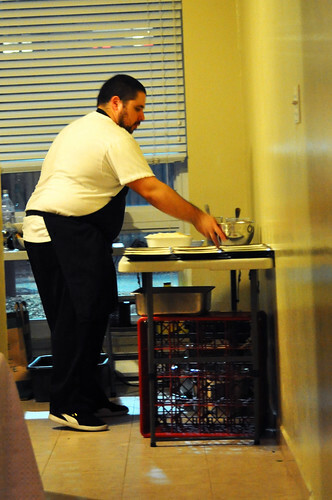 Having previously worked at the famed kitchens of Chef David Bouley (Bouley) and Chef Thomas Keller (Per Se) and more currently at 5 & Diamond as well as Hotel Griffou, Chef Santos took everything he learned from these various establishments and decided to venture off on his own, taking his cooking in his own direction. 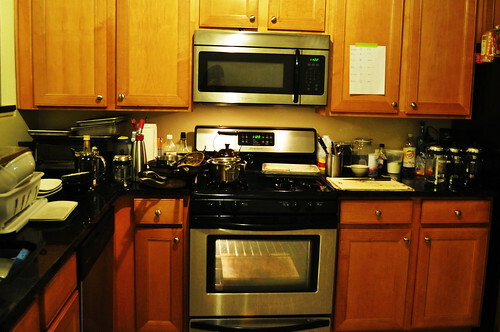 The kitchen at Chef Santos's apartment. 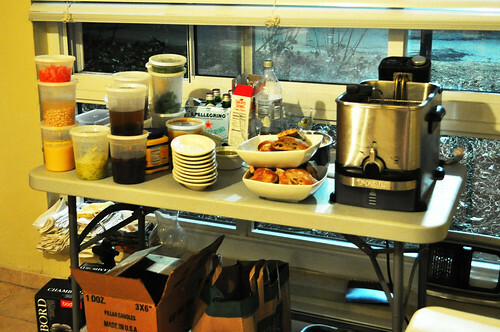 One of two side prepping tables in the kitchen with ingredients and a deep fryer. 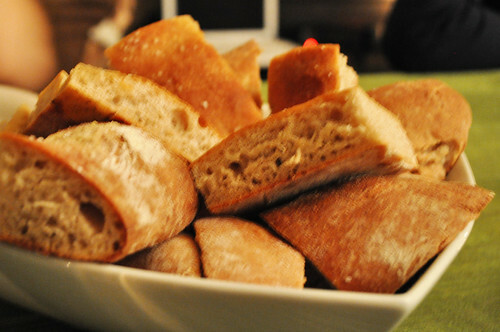 Homemade bread that was totally addicting. Dying for some more even now! After getting settled in and enjoying some pinot noir (courtesy of Um Segredo's encouraging BYOB), everyone took seats at the communal dining table set for twelve in the living room. There were some brief introductions among the guests -- in fact, Linda and I met another couple who lives on RI plus another woman who had lived there for twenty something years before moving into Manhattan with her family! Chef Santos gave a brief introduction about himself and Um Segredo, mentioning that there had been many requests for a "vegetarian" menu since the supper club's first installment, resulting in this dinner featuring a "tasting of vegetables." Alice took an informal poll from all the guests, asking if there were any vegetarians in the room. Surprisingly enough, we were all omnivores with the exception of one pescatarian. Interesting, indeed -- just goes to show you the elusive, yet compelling, power of vegetables :P! Chef Santos then left us to converse amongst ourselves and to munch on some bread while he began his cooking for the night. A short while after, the first course was served. 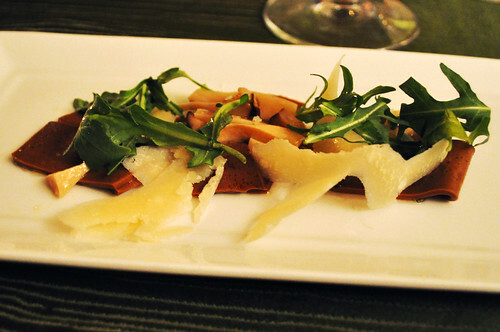 The first course from the "Tasting of Vegetables" was a mushroom carpaccio with porcini mushrooms, shaved Parmesan cheese, and arugula. The carpaccio was made using a purée of mushrooms mixed with agar agar, creating a gelatinous (yet still vegan/vegetarian) block which he then thinly sliced and plated. It was lovely starting course, light and fresh, as it eased us into the courses ahead -- the sheer "thinking outside of the box" to turn a raw vegetable somehow into a carpaccio (typically thin slices of raw beef or fish served with a sauce) was a promising harbinger of what was to come. This could definitely compete with a protein-driven carpaccio in a snap. 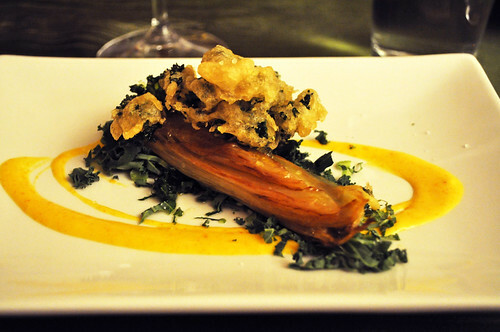 The next course was a "winter salad" with grilled endive, kumquat purée, and kale tempura. Chef Santos introduced this course as a stark contrast to the expectant salad, whereby its ingredients would be served raw and cold. As the dinner took place in the middle of the winter season, he thought it'd be fun to experiment with a "warm" salad -- in the same way you would have warm soups in the colder months and chilled soups in the summer months. With the added bonus of a beautiful presentation, this salad certainly warmed me up. However, I still haven't blossomed into liking bitter greens like kale and endives, even though my mom is convinced that I'll grow into it eventually :P. So while the tempura added some softness, and the kumquat purée some sweet tartness, to the otherwise harsher taste tones of kale, it just wasn't my cup of tea. Still, beautifully done, and props to the chef for turning some bitter vegetables into an elegant art. Now this next course was more my style -- smoked tomato soup served alongside aged cheddar grilled cheese. The tomatoes themselves were individually smoked before becoming puréed into a creamy, well-blended flavor of soup -- the kind that reminds you of those days, after trekking home from school through the elements (most likely snow and rain), to find a warm bowl of densely blended, hearty tomatoes waiting to be spooned alongside triangularly cut just-pressed grilled cheese sandwiches. Chef Santos's tomato soup had so much depth in flavor -- the smoked tomatoes really did a number for it overall -- maturing much from the simpler, childhood days of Campbell's cans. Oh, and the aged cheddar grilled cheese made for the perfect accompanying "starch" for ratio eating, especially with something as heavy and concentrated as a tomato soup. The cheddar had a good medium between mild and sharp working well with each dip into the soup. At this point of our dinner, you can definitely feel the dishes progressing in size, portion, and weight. I think after having this, it totally slipped my mind that everything on the menu for the night was all vegetarian. It's funny how a skilled sleight of hand can transform and otherwise "lacking" meal (i.e., in protein and meatiness) into a meal that has an equitable "fillingness" as you would get with a non-vegetarian course. 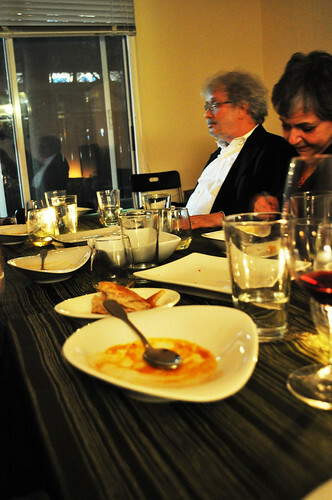 View of the communal dining table after finishing the third course. 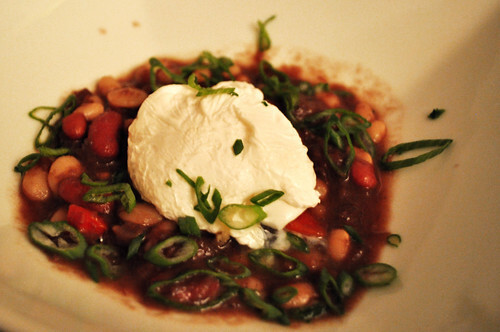 Following the smoked tomato soup and aged cheddar grilled cheese was a poached egg and caramelized onion cassoulet with scallions and beans. Traditionally a French-style stew of meat and beans, this unconventional cassoulet was a risk taker, with a single, delicately poached egg to compensate and to unwittingly demonstrate that, with the right execution, the absence of meat need not be so pervasive as to ruin a meal but to enhance it. The poached egg was hands down my favorite part of the course. The beans were a just a bit undercooked for me, but the stew's base certainly made up for that. I even used some pieces of bread to wipe clean the bowl! 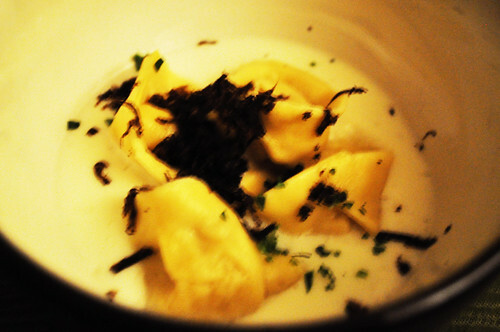 The last course before dessert was tortellini with celery root, truffle foam, and shaved black truffles. Chef Santos urged that we eat this immediately, as the aromatics and flavor dissipate rather quickly. The truffle foam and aroma from the shaved truffles did wonders for the tortellini, was it added that layer of sating fullness. While I felt the pasta was slightly under al dente for me,the tortellini had strings of celery root tucked inside, giving the dish a soft and subtle crunch (in texture, not decibels, haha). A peek of Chef Santos plating the last course of the night. My only regret of the night was not spending some time with the chef in the kitchen -- I got so incredibly chef-struck that I was mostly speechless until I was able to garner some cohesive sentences at the end of the night to thank Chef Santos for a wonderful meal. I know better for next time -- definitely going to do lots of observing! 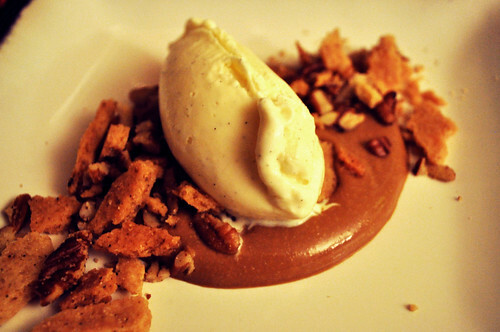 To conclude, Chef Santos presented us with a deconstructed pecan pie with a broken brown butter crust, toasted pecans, a scoop of vanilla gelato, and generous dollop of molasses (if I recall correctly). The crust was light yet crunchy -- like thin, freshly made graham crackers -- and exuded that feeling of utter delight when you devour a dessert that really gets your sweet tooth. What I liked about this dessert was that there was nothing complicated about it. In essence, it was truly pecan pie in taste -- just not served as the typical pie sliver-wedge. Going in the same way of the smoked tomato soup and aged cheddar grilled cheese, this is another one of those comfort foods that will always be welcomed in my stomach. I hope Chef Santos makes this again for another dinner. Additionally, not only does he know how to cook and host one hell of a dinner party, but he is easy to talk to, extremely knowledgeable, comical, and very humble. The conversations we had with him were never brushed off -- his enthusiasm for cooking and all else that is related to it made for an enriching experience, via your palate and your noggin. There were several questions going around that night, and not for one second, was he indifferent or any less animated or lively. In fact, he welcomed it. Those are the best chefs to be around. Who knew I'd ever be able to say that I can stroll right down the block and around the corner to experience such a four-star restaurant-caliber supper club that was prepared in a city-sized kitchen. 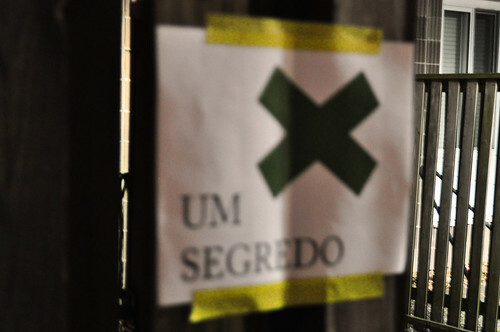 So Um Segredo -- watch out! You'll be certainly seeing more me at upcoming dinners -- your menu themes never cease to impress! Price point: $75 cash donation, plus gratuity for service; BYOB.